Why does a glass of Port taste and feel so good on these very chilly nights? But, for red wine, the work isn’t over quite yet. There’s still a little pressing to do. the winemakers are greedily getting the last bit of color and flavor out of the grape skins for their reds before sending them off to the barrel cellar. This machine is first stop for most reds when they come in from the vineyard. It removes the stems and breaks the grape skins open. When you’re finished crushing, you’ve still got the skins and seeds,which go right into the fermentation tank with the juice. 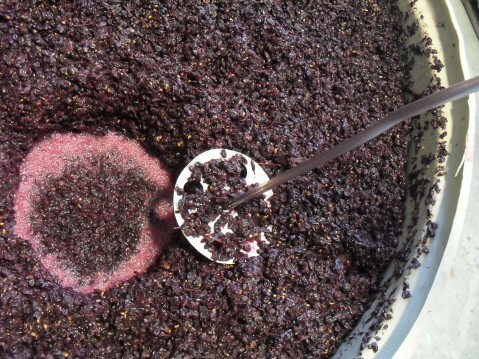 As you know, all of the color and most of the flavor in red wine comes from the skins. 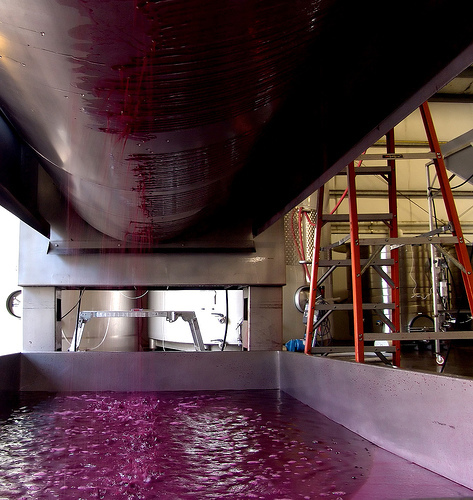 The press leaves the winemaker with only liquid, however cloudy. Well, they’re related but not quite the same. And what about Shiraz? Are you a fan of Syrah or Petite Sirah? What are some of your favorite brands? Maybe you’d like to take a lonely crush widow – or widower – to lunch! Cheers! What’s the word on every grower’s and winemaker’s lips right now? Brix! Doesn’t sound very winey, does it? Is it about the proper way to arrange your chapeau or ? Cap management is a term that’s used only during harvest, but it’s an important one. As you know, all of the color and most of the flavor and tannin in red wine comes from the grape skins. With very few exceptions the juice of a dark variety runs clear. TRIVIA! The few varieties with red juice and flesh are called teinturier (ten-toory-AY). The best-known example in the wine world is probably Alicante Bouschet, which is often part of a field blend and can also be used when the winemaker wants to ramp up the color. What’s the Difference Between Cabernet Sauvignon and Merlot? Which do you reach for most often? Do you have a favorite brand?